Geert is piano player and joined the Electric Band in 2008; since then he arranged multiple songs for Night of the Proms. The last years, Geert is standing out because of his performance with ‘Het Goede Doel’ (from the hits ‘Belgie’ and ‘Vriendschap’) and his many arrangements, like for the live shows of Gerard Jolinh and for the Toppers (with Rene Froger). He’s also active as producer of his own studio and guides a lot of artists outside the Proms. Rogier plays the bass guitar and joined the Electric Band in 2007. 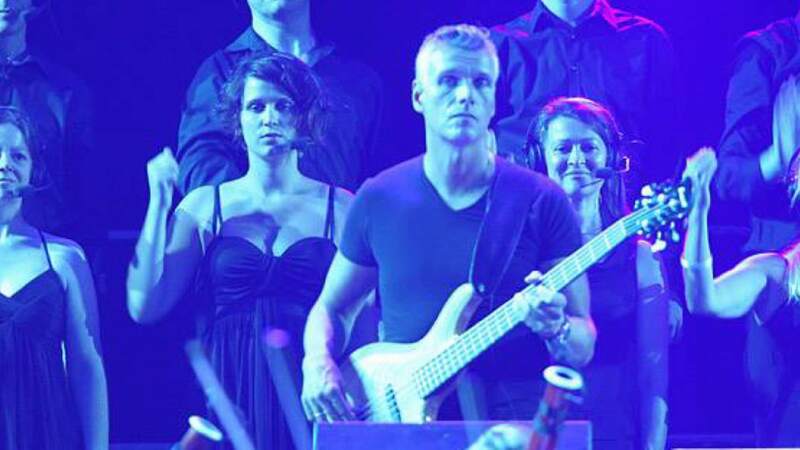 He teaches also bass guitar at the Conservatory of Enschede (The Netherlands), guides singer Do, produces recording and edited the CD’s and DVD’s of Night of the Proms, furthermore you can find all kinds of references to him on your google-search. It’s also important that you know he loves playing with an in-ear system combined with a shakerfloor (a kind of shaking floor that converts the sound in low vibrates) “It’s working perfectly, you have a hifi sound in your head, but it got the balls”. Musicians: it a separate race! Patrick De Smet is the Belgian of the company, living in Mespelare. As profession he’s artistic director of the music chapels of Defense (Guides / Air force / Marine). When he was 4, he played at the harmony of his father, went to music school and academy, and finally went to the conservatory. When he was 16, he was asked as percussionist at the Symphonic orchestra of the (at that time) BRT, from there on he was asked for a show in Antwerp with the Philharmonic orchestra; it appeared to be the first Proms edition. At the second edition he wasn’t there due to a world tour with ‘I Fiamminghi’ conducted by Rudolf Werthen. A year after that, he joined the Proms Orchestra again, where he never left. He was also added to the Electric Band. Besides that he was involved with ‘The Symphonic Factory’ on ‘Melo Ritmo’, his own ballroom orchestra and theatre project, together with Carlo Willems. We know this busy bee as a decent and fun musician, and also a party-animal. Als Student spielt Arnold van Dongen als Gittarist bei Lois Lane. Er entwickelte sich zum gefragten Session-Musiker und spielt mit großen niederländischen Acts wie Ilse DeLange, Total Touch und Mathilde Santing. Auf dem neuen Album von Sängerin Glennis Grace ist er ebenfalls zu hören. Arnold van Dongen spieltbei den Proms seit 2012 die Gitarre in der Electric Band. Er ist somit der Nachfolger von Leendert Haaksma, Laurie Wisfield, Jonas Isacsson und Rob Winter. Trevor Murell wird aus gesundheitlichen Gründen nicht mehr das Schlagzeug der Proms bedienen können. Ein schmerzlicher und leider auch unvermeidlicher Verlust für die Night of the Proms Familie. Als neuer Drummer folgt Hans Van den Hurk. Bei der Premiere in Antwerpen 2011 konnte er bereits überzeugen. HEARTFELT tributes have been paid to professional Scarborough musician Aidan Lawrence, who has died aged 45. A post mortem revealed that Aidan, known to friends as Aidy, died of internal bleeding brought on by alcohol addiction. His brother Denzil, who lives in Sheffield, said Aidan died in his sleep, unexpectedly, at their father Ians home in East Ayton in the early hours of Sunday morning. Aidan was single, had no children and lived in St Johns Road. His mother died in 2008. The funeral will be held at the crematorium 2pm on Thursday 19 January. Donations will be accepted for the Easy Band. Aidans musical education began with the Easy Jazz Orchestra at the Sixth Form College and continued in Leeds on a jazz and popular music course. Before he turned pro, Mr Lawrence played in various bands ranging from Busby Stoop and his Aunties from Loughborough in the 1980s to the Woolgatherers and Bataboys more recently. As a pro, he worked with many household names including Meat Loaf, Supertramp, Toto, Status Quo and John Miles, who recruited Aidan for his Euro-Proms shows at arenas and large concert halls. He had numerous good friends, many of whom are musicians, and all of whom are deeply shocked by Aidans sudden death. Aidan was the best musician Ive played alongside, said saxophonist and lifelong mate Dave Kemp, who played with Aidan in various bands over the years. He was funnier than any comedian and he was my best friend. During the Easy Band days, Aidan and me, along with Andrew Maloney on drums and Stephen Moorhouse on keyboards, played in an instrumental band called Streetbeat. Thanks to Aidan it was a great laugh. We both had a great fondness for 70s disco music. Our first season together was at Walliss holiday camp with the Dave Pinkney band. We did several summer seasons together including Bognor Regis and Great Yarmouth where Aidan showed off his cooking skills. One time in particular, he woke me at 4 in the morning when a full roast dinner with all the trimmings was waiting to be eaten. Alec Scott, who played with his brother Bob, Aidan and Dave in Busby Stoop, said he was absolute devastated. The man was a revelation as firstly a person and, of course, his absolute competence as a bass player, said Mr Scott. I was introduced to Aidan by his mate Dave Kemp in the Strongwood when I think Aidy was 16. He was a very quiet fresh-faced young man and you wouldnt think he could beat up a good scrambled egg. But when I first saw him play his four-string bass and with his mate Dave by his side you were brought into a future world that only they understood and the rest of us just wanted to go home. We played together in Busby Stoop (a great band of its time from my point of view) and on and off over the years. We became real pals, good friends. We always had time for a get-together and hed tell me of his exploits over in Europe. And lately seeing him in Sainsburys in December where we had a brief chat. After seeing him, he texts, his words were great to see you mate, will catch up soon. That was Aidy. Unselfish, generous, funny (very funny) and time for everyone he met. There will not be a bad word said for this man. If the world was full of Aidans, what a better place it would be. Paul Toole and Gill Brown, who knew Aidan from the Stage Door and Talbot music venues, said: Aidan was a fantastically talented musician and we remember watching him with awe when, as a teenager, he appeared at the Hole in the Walls Sunday lunchtime sessions playing with Busby Stoop and blowing away all the old hands with his skill and enthusiasm. As he got older there was always a generous word of encouragement for less experienced players at our venues. Aidan was modest about his achievements, however, and he had a wonderfully wry sense of humour. I recall how he would jokingly announce how much he disliked music, only to pick up his bass and outclass most of the people around him. He was more than just a great muso to us though, he was also a great friend. One of my enduring memories is when, just after hed passed his test, he drove over to rescue us from Sutton Bank where wed stupidly stranded ourselves on foot. I think we deserved the ribbing we got all the way home. Well miss him lots and his untimely loss leaves all our lives a bit poorer. Paul Tilley said Aidan was a fantastic musician and a great bloke humble, funny, talented and he played from the heart. I had the pleasure of working with him in many musical situations. He had a self-deprecating sense of humour and a wry turn of phrase that could crack me up. His time, feel and deep sense of groove was wide and expansive and his touch on the bass was second to none. He shared the stage with some of the biggest names in music (Randy Crawford, Joe Cocker) and he stood shoulder-to-shoulder with them. I last saw Aidan just before Christmas when he came to play with us all at the Blues Club at the Cask. He was on good form and we were all delighted to see him. It is such a shock for the Scarborough musician community to lose our mate. He was a gem. Mark Gordon described Aidan as a truly gifted musician and wonderful human being. It was an honour to share a stage with him but even more of an honour to count him as a friend. Anthony Springall said he didnt really want to believe Aidan wasnt going to be around for another lively pub conversation about lifes innate surrealism. I think one of the last things he said to me was Like the weirdy noises you can get out of those terepins, then he went next door for a pizza. Andy Crossland said he was grateful to Aidan for the advice and encouragement when I was starting out as a bassist all those years ago at sixth form and having a level of humility and modesty that totally belied his prodigious musical talent. Andy Crossland wrote on his Facebook page: Aidan, thanks for the advice and encouragement when I was starting out as a bassist all those years ago at sixth form. Thanks for having a level of humility and modesty that totally belied your prodigious musical talent. Thanks for the brilliantly funny stories about your tours around the UK and Europe. Thanks for patiently listening to me blather on about playing the Spotted Cow, before you sheepishly revealed that youd played the Ahoy Arena in Rotterdam with Joe Cocker the same night wed been playing to two men and a dog in York. Thanks for being part of our Tap & Spile pub quiz team. To be honest, general knowledge wasnt your strong point, but at least Id finally found something I could do better than you (cos it was never going to be bass playing). Thanks for the praise after a good gig (and the not so good ones). Thanks for eventually nagging me to buy a Musicman Stingray - get one, theyre mint! You know, you were right. Thanks for being a good un Aidan, Im gonna miss you. Phil Hooley said: I first saw Aidan playing in the superb Busby Stoop and His Aunties From Loughborough at the old Stephen Joseph Theatre at Westwood, with Dave, Alec Scott and Bob Scott. Years later, I managed to persuade him to join the Tadpoles, which was a fairly short-lived band but we had some memorable gigs, including playing on the opening and closing nights of the grandly named International Bike Week (remember that picturesque site near Seamer tip - Suzie Quatro the headline act?) We were invited to play on the Harley Davidson stand that weekend which included a couple of trips out on the latest bikes, much to Aidans delight. Aidan was a working musician, playing bass in summer seasons, pantomimes and later variety shows for the likes of Bobby Davro and Lilly Savage, but he had the uncanny knack of usually making it back to Bacchus just before closing time, no matter where he was in the country! He was a consummate professional, as well as being extremely talented, and always found something positive in every job he took on, even if it wasnt particularly his style of music. 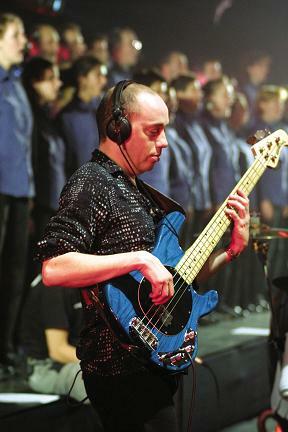 As such, he was very popular and respected among other professionals which led to further work with John Miles, the musical director who was involved in A Night at the Proms, which toured Europe annually, including top acts such as Toto, Cindi Lauper, Chrissie Hind, Donna Summer, Shaggy, Simple Minds, Status Quo, OMD, Joe Cocker, the Pointer Sisters, Roger Daltrey, Bonnie Tyler, Randy Crawford and one of Aidans favourites, Nena (remember Nine and Ninety Red Balloons?) to name but a few. For those who would like to see Aidan at his very best, its worth checking out Randy Crawford singing Street Life on A Night at the Proms on Youtube, as he lays down the bass groove for the orchestra in front of an audience of several thousand people. Aidan told me something of the life on the road, including VIP trips to the Monaco Grand Prix and watching Bayern Munich as a guest, but remained self-effacing about it all. He received a greeting from Steve Lukather (guitarist from Toto) which he kept on his answer phone, not quite believing he could possibly be ringing him! Aidan always returned to Scarborough whenever he could and continued to play with his many good friends on the local music scene, stepping in to help bands, often at a moments notice, and playing at the regular Thursday night sessions at Indigo Alley. Occasionally he could be coerced into performing a bass solo which always brought the house down, but Aidan always remained modest. In the past few years he has played with the Woolgatherers. As a personal friend, Aidan always encouraged me in my songwriting, and always managed to make songs sound better with his beautifully expressive basslines. A kind, and caring man with a lovely sense of humour, Aidan Lawrence was a truly gifted musician of international status, who generously shared that gift with everyone that knew him. We will miss him. Tony Lavery said: It is with great sadness that Scarborough mourns the loss of bassist Aidan Lawrence, a wonderfully talented and gifted musician, who managed to attain in his short life what most of us local musicians could only dream about. I first met Aidan when he was about 10. His dad Ian, who worked with my dad Tom, brought Aidan and his brother Denzil over to our family home in Whitby to meet us all. Aidan at that age had already discovered his love for music little did we know what talent lurked within. Aidan went through school learning his craft and joined the Easy Band, a multi-schools band made up of particularly gifted young players, along with his musical compadre Dave Kemp under the musical directorship of Tony Turner. He later went on to hone his skills with local bands, setting the calibre very high, probably most notably with Busby Stoop and his Aunties from Loughborough along with Dave and the Scott brothers Alec and Bob, packing out the Stage Door pub with their funky instrumentals, played with impeccable style, whilst also taking on work from other local bands. Soon his talents were becoming noticed further field and he started taking professional work playing in theatre bands all over the country, playing for various TV stars, supplying the music in pantos. In 2001, he landed a coveted role playing bass for John Miles, who had written and performed his own hits including Music, which was a chart topper in the UK in 1976. John moved on to be MD for the Tina Turner Band in the 80s, touring all over the world and later engaged Aidans services in his own productions, the John Miles Euro Proms. Travelling with John and their large orchestra, Aidan toured Europe with the ensemble, filling arenas and large concert halls and playing alongside international stars such as Randy Crawford, Supertramp, Steve Lukather of Toto and even Brit faves Status Quo to name but a few. In between trips he wouldve regularly been seen at Indigo Alley for the legendary Thursday night sessions and in recent months playing with Phil Hooleys Woolgatherers. His success as a player never changed the man. Throughout his career, one of the things that always stood out was Aidans friendliness. He was quite simply the nicest guy I have ever known and anyone else who had the pleasure of knowing him would tell you the same. Roy Piper said: Someone I have known as a friend and fellow player for about 20 years, Aidan was without a doubt the bass player I admired the most. 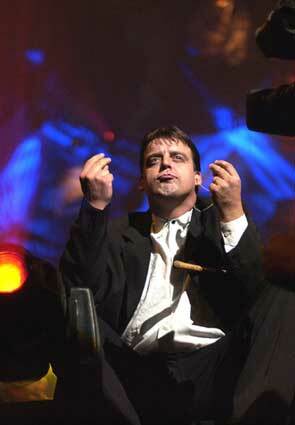 His skill, adaptation, musicianship, friendship and sense of humour, will be greatly missed. A sad, needless and unbelievable end to a brilliant person. Rich Hodgson said: Aidan did a lot of professional gigs, summer seasons, pantos, tours, etc, and was out of town a lot. He was in a funk band with Ronnie Wray, Julia Wray, Mike Lynskey, Simon Coles, Bob Scott and Phil Lavery. He often played at Indigo Alley, at Thursday night jam sessions of a couple of years ago. I first saw Aidan when he was a teenager; I think it was at the Stage Door, or even its predecessor, Elvenhome. I remember thinking, Hes a bit good, who the heck is he? I was able to get him as a deputy bassist for the Hole in the Wall Gang on a couple of occasions and a gig in York with ace guitarist John Prendo Prendergast. Hardly anyone turned up - it was a door take, and we all got 50p each! Aidan wasnt bothered, it was a great, enjoyable gig. I think we all wish hed played more often, these last few years. Such a great talent, sadly gone. John Daniel knew Aidan as a fine bass player whose elegant, dextrous virtuosity contrasted sharply with my own two-fisted assault on the instrument. The deeply affectionate comments on Facebook alone indicate how much Aidan was liked and respected. Actually, I didnt know him that well as a person, rather as a fine bass player, whose elegant, dextrous virtuosity contrasted sharply with my own two-fisted assault on the instrument. Aidan worked with some big names in the music industry, including John Miles, Meat Loaf and many others. I believe his musical education began with the Easy Jazz Orchestra and continued at Leeds on the jazz and popular music course. In the years that followed, he continued to play with musicians of the highest calibre and must surely have accrued a vast amount of knowledge and experience in his short, but brilliant career. I last saw Aidan early in 2011 at a Cellars gig. In the break, we compared notes about bass equipment and laughed at lifes twists and turns. He was a dear soul and we all will miss him. Tony Turner said: Aidan was one of a number of young musicians to hone their musical talent as a member of Scarborough Music Centres Easy band. He went on to become one of UKs very best bass players and spent a lot of his working life in Europe and the rest of the world. However Scarboroughs active musician community have really appreciated how willing Aidan was to work with them in the local pubs and clubs when he wasnt on the road. He always returned to Scarborough and while he sadly is no longer going to share his wonderful talent with the local musicians we all have great memories of our gigs with such a talented, witty but humble individual. We will miss him greatly. Julia Wray: Aidan was sweet, kind, warm, shy, gentle, affectionate, generous, modest (to a fault), incredibly funny, unbelievably talented, boyish and charmingly child like at times. His sense of humour was, clever, quick, dry and antecdotal; he made everyone laugh. And for a shy man, he had an incredibly infectious laugh. He laughed, I laughed. He told hilarious stories of his time on the road gigging around England and Europe. I was lucky enough to share some of those moments with him. He always had an encouraging, kind word for the struggling muso, me being one of them. He was always too modest to teach, always said he couldnt show anybody anything, but that was Aidan. His boyishness showed in his love of cars and dinosaurs. He just loved dinosaurs, the real thing, models, you name it. He particularly loved the Jurassic Park films and his dinosaurs wallpaper boarder around his bathroom. He loved James Bond, well the E-type Jaguar. They used to have one in the vintage car garage in Pickering. Many trip were taken to ogle it and dream of one day owning it. The only things that I can think he was particularly particular about (apart from playing the bass) was tea, and food. Tea always had to be made in a warmed pot, with a tea cosy on it, and he only really liked meat, potatoes and bread-based foods, sandwiches, etc. He told me a few years ago that hed tried a chicken tikka masala and actually quite liked it, said with a wink, a nod and a wry smile. This was quite a breakthrough for Aid and made for much hilarity - maybe you had to be there? He made everyone laugh and smile, we all loved him, he will be missed so much!!! Nach Laurie Wisfield, Jonas Isacsson und Rob Winter spielte von 2009 bis 2011 Leendert Haaksma die E-Gitarre.